← your greatest trump card is not ability, but availability. 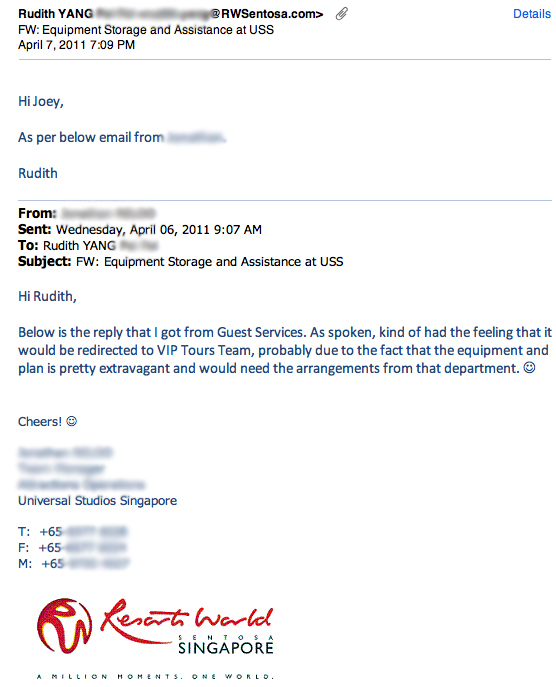 I actually called USS VIP Tours and asked if I could speak with someone who would be willing to coordinate the event with me. The staff who attended to me was freaked out at my every request, so she brought it to her supervisor who brought it to her manager. Be it to bring equipment in, make a complimentary recce trip, or have Shrek or Fiona make an appearance. I don’t blame them though, because it’s not normal that they speak to some nutcase who wants to execute something unprecedented and radical at the hallowed grounds of USS. But Rudith was superb. She sent out a couple of emails to the VIP Tours department as well as a couple of her friends who were in Ground Operations. Well, no one had presented them with such a request before and as much as I tried to PR my way into their PR department with my PR tactics as a former PR person, I faced a stone wall time after time. So after a few more email exchanges and phone calls, I decided against doing this officially because it was just way too difficult, cumbersome and tiring to clear the red tape. Believe it or not, they even told me that Shrek and Fiona cannot go to New York because of intellectual property issues. Apparently, these two characters cannot leave Far Far Away… Can you believe that!? I was bemused by their unbelievable but understandable insistence on sticking to the integrity of the character. So I had to count on Rudith and the by-left (aka more creative) methods. I must say, she really, Really, REALLY, went out of her way to assist me. Now, what Rudith had done for me, I will not and cannot disclose, even though I really want to because of the magnitude of her kindness, but I do not wish to get her into trouble or set a precedence for USS and get into trouble with them. Not to worry, she didn’t do anything that would cause her to get struck by lightning… So let’s just say that with Rudith’s help, things became way easier to plan and execute, so I was really thankful for her intervention! Next chapter: the two visits before the actual visit. Posted on July 23, 2011, in A Walk To Remember, Picture Perfect and tagged Far Far Away, New York, Princess Fiona, Resorts World Sentosa, Rudith Yang, Shrek, Universal Studios Singapore. Bookmark the permalink. 4 Comments. (: really enjoy reading all ur post.. am one of those crazy ppl that caused your site hits to surge.. haha (: keep posting! love the proposal series.. what a sweet way to remember and record all that has happened. and all the entries that depicts your thanksgiving to God and passion for the people He love. encourages me.. (: u really do have that gifting for writing. (: its a gift that God has given to bless people reading, like me. 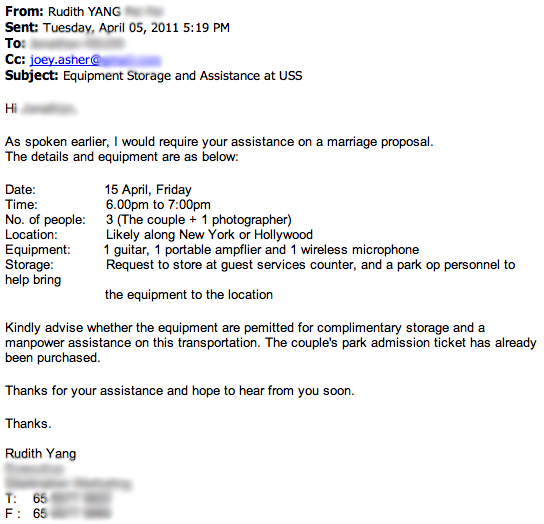 (: God bless you and Huiyi! Hi serene! Thanks! Yeah it’s been a joy for me as well recollecting thenmemories on that week leading up to the proposal. (: Thanks for your encouragement too – I am a simple writer. Sometimes that’s the best way to write. Do you keep a blog too? nope i don’t.. haha don’t have that gift. haha (: the most active i can be is on twitter and fb. (: will follow you on twitter.